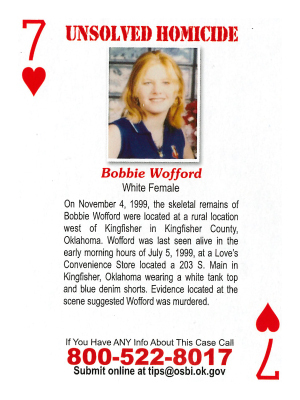 On November 4, 1999, the skeletal remains of Bobbie Wofford were located at a rural location west of Kingfisher in Kingfisher County, Oklahoma. Wofford was last seen alive wearing a white tank top and blue denim shorts, in the early morning hours of July 5, 1999, at a Love's Convenience Store located at 203 S. Main, Kingfisher. Evidence located at the scene suggested Wofford was murdered.